You are currently browsing the category archive for the ‘O-Hanami’ category. 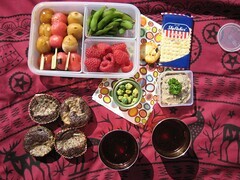 On Sunday March 25th we had a very special — BIG — picnic bento to celebrate spring with our friends. 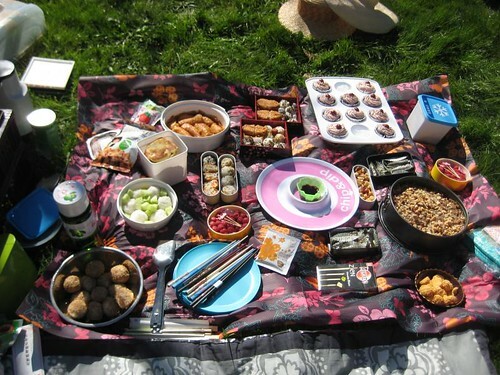 Like every year, we held our own Hanami Matsuri (cherry blossom feast) in the Amsterdamse Bos sakura garden. Unfortunately the Japanese cherry trees were only just starting to bloom, but there hasn’t been a better spring day afterwards so we were lucky anyway! First of all I had to bake ‘something cherry’. 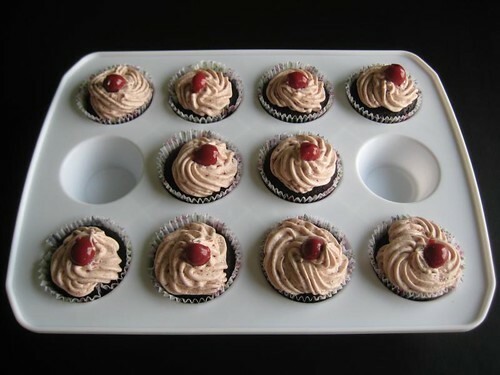 Browsing brought me to a Martha Stewart recipe for vegan chocolate cupcakes with a cherry frosting, tried by BakedBree (substituting raspberry vinegar for plain and using cherries from a jar as fresh are not in season). Bree and her omni friends were quite positive so the choice was easily made! At the risk of sounding immodest: don’t you think they look awesome?? :) And yes, they were nice as well.. but I don’t think I’ll make them again. I didn’t much care for the buttery topping and you can’t really have the cupcakes without. 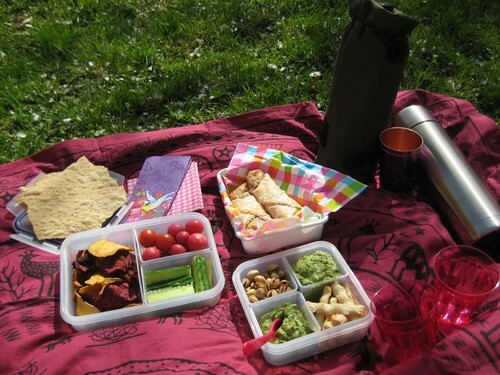 Here’s the rest of what we brought to the picnic. Up front is my sakura box loaded with tofu puffs or inarizushi (a recipe from The Vegetarian Table: Japan cookbook by Victoria Wise), onigiri rice balls filled with umeboshi (pickled plum) and chickpea-wasabi mixture, rolled in respectively plum furikake and nori seaweed. For drinks: plum wine, sake and lots of hot water for a choice of sakura hoija tea, plum vert, sencha, gyokuro asahi and genmaicha. And if you thought that would be all… There’s more! Because our friends are foodies too. :D They contributed their own yummy goodies, like vegan apple pie, dolmas, dorayakis (sweet red bean paste pancakes) and cheese cookies for the non-vegans among us, cucumber and more nibbles. We think alike because additional batches of inarizushi and onigiri (with cucumber and plum filling) were brought to the party. Next up is my Bihun Bento! Yesterday we had our yearly celebration of Hanami: cherry blossom viewing, in the Amsterdam Woods’ Japanese sakura garden. 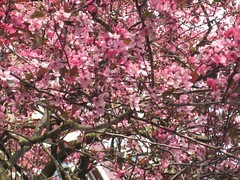 The weather was FABULOUS and I have not seen so many people in the blossom parc before! A sign with flowers in remembrance of the earthquake/tsunami victims attracted quite some attention too. Mr Gnoe was reading part 3 of Murakami’s 1q84 but Poor Me had to do some homework for my film review class: writing about Barney’s Version — a movie that was more entertaining than I had expected and evoked thoughts about Rossetti, Dante, (William Blake), heaven and hell. I wonder if my fellow classmates had the same associations. 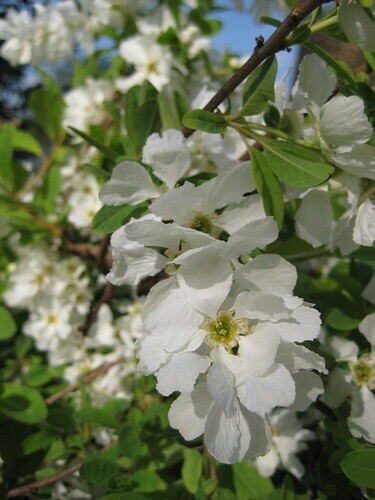 Have you been celebrating the blossoming of trees? Hurray, it’s time for Hanami! 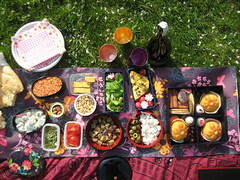 On Sunday we went to view the cherry blossoms in the Amsterdamse Bos (Amsterdam Woods) and had our yearly picnic. 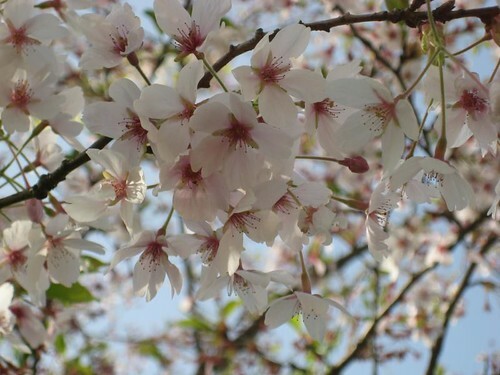 In 2000 the Japan Women’s Club planted 400 cherry trees in celebration of 400 years of trade between Holland and Japan. I absolutely love this part of the Amsterdamse Bos, which is called Kersentuin (Cherry Garden). 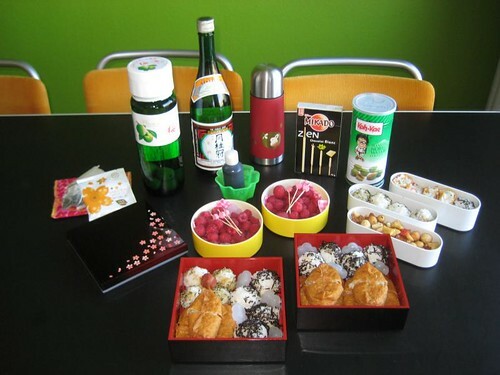 Our contribution to the hanami party was bento #97. A picnic under the cherry blossoms was the perfect excuse to finally make those poppy seed scones I had been planning for a while! At first I was afraid that it had all gone wrong, but they were actually quite good! We ate them with some raspberry jelly and mascarpone. The recipe for poppy seed scones will be up on Graasland in the near future. The recipe for the scones can be found on Graasland! 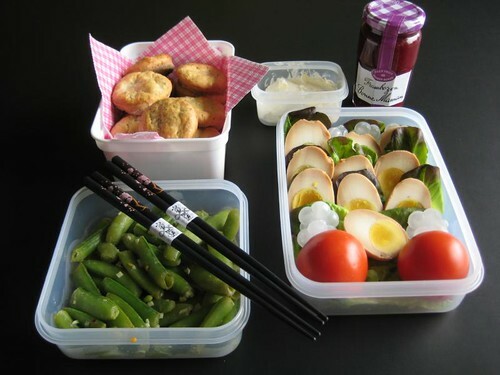 The other foodies in our hanami bento are sugar snap salad with garlic & wasabi and miso tamago (miso marinated egg; recipe below) on a bed of red salad and accompanied by tomatoes that had to hold everything together ;) The white sakura flowers you find laying between the eggs are ice cubes. Aren’t they cute? After a long search for appropriate cool-thingies I found these at the Dutch department store HEMA. 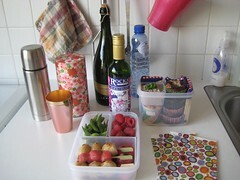 A great tip for bento lovers in (or visiting) Holland! 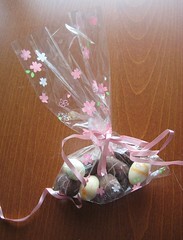 I forgot to include our leftover Easter eggs in my cute sakura bag in the picture, hence the seperate photograph. 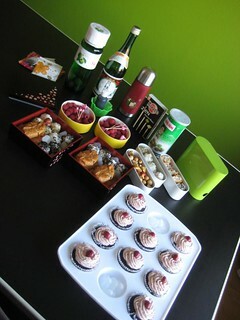 Beverages we brought along (not shown): our traditional kir royale (prosecco wine with creme de cassis), pink grapefruit juice, gyokuro classic sencha tea and plain tab water. 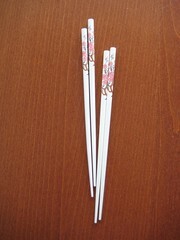 Bento-Babe had a kind surprise for us: sakura chopsticks! 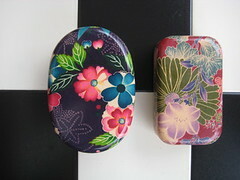 I really adore them; they’re exactly like my black ones that you see in the picture above, but white. I now have a complete set! 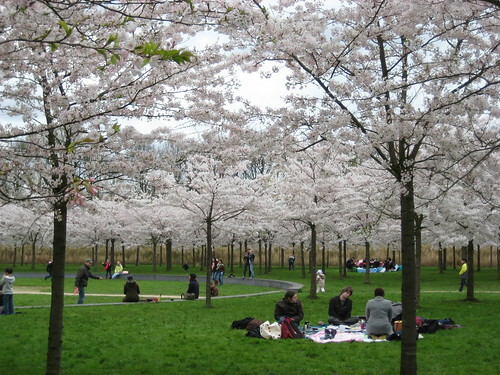 Celebrating O-Hanami is not common in The Netherlands. But it is one of the major festivities in Japan! Wikipedia (edited): Hanami (lit. ‘flower viewing’) is the Japanese traditional custom of enjoying the beauty of flowers, in this case almost always meaning cherry blossoms or ume blossoms (prune). In modern-day Japan, hanami mostly consists of having an outdoor party beneath the sakura during daytime or at night. The practice of hanami is many centuries old. It was first used as a term analogous to cherry blossom viewing in the Heian era novel Tale of Genji by Murasaki Shikibu; often considered to be the very first work of literature. Whilst a wisteria viewing party was also described, from this point on the terms “hanami” and “flower party” were only used to describe cherry blossom viewing. The delicate flowers are seen as a metaphor for life itself, luminous and beautiful yet fleeting and ephemeral. I have read part of Genji Monogatari (not all) and it might just be how Mr Gnoe and I came to have our own hanami here in Holland! Mix miso with syrup; if necessary add a tiny bit of warm water to make it smooth. Spread the mixture in the middle of your piece of plastic, put the egg in the middle and wrap the cling film around the egg. Twist the plastic shut at the top, and gently squish the miso so that is completely covering the egg. Put the egg(s) in a container in your refridgerator and let rest for at least 5 hours, preferably a day. 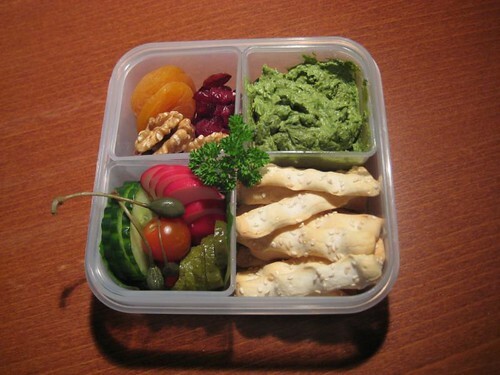 According to Maki from Justbento it can be kept up to a week. Remove the cling film when you want to use the egg. I prefer to wipe off the remaining marinade with some kitchen paper. You can leave it on if you like, but red miso is pretty strong..! How wonderful: April’s Hello Japan! 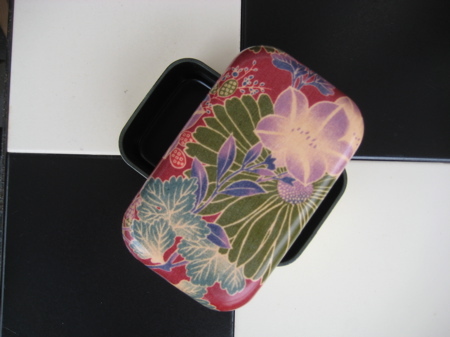 mini challenge is all about spring & sakura too! 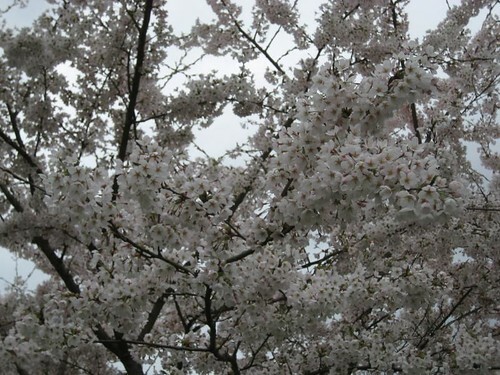 Our task is to celebrate spring, and in particular the beloved sakura. Well, that’s exactly what I’ve been doing! :) Giving life to an old tradition on the other side the world.